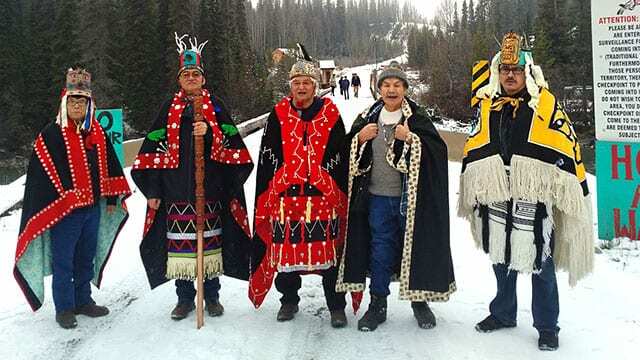 Wet’suwe’ten Nation Hereditary Chiefs (APTN file). British Columbia says it’s starting a new reconciliation process with the Wet’suwet’en hereditary chiefs, who are at the centre of opposition to a natural gas pipeline in northern B.C. The province says in a release Thursday that the government and the Office of the Wet’suwet’en are undertaking a process focused on Wet’suwet’en title, rights, laws and traditional governance throughout their territory. The release says B.C. has appointed Victoria MP and lawyer Murray Rankin as its representative to help guide and design the process, adding that Rankin has an understanding of the Supreme Court’s historic Delgamuukw decision that helped define Indigenous title. It says the province and the Wet’suwet’en are committed to explore a path forward together that seeks to build trust over time and meaningfully advance reconciliation. The Wet’suwet’en hereditary chiefs oppose Coastal GasLink’s plans to build a pipeline from northeastern B.C. to LNG Canada’s export terminal in Kitimat, and RCMP arrested 14 people at a blockade last month before reaching a deal with the chiefs. The province says its commitment to lasting reconciliation is not connected to any specific project, and the new process will build on discussions that have been ongoing since Premier John Horgan and Indigenous Relations and Reconciliation Minister Scott Fraser visited the territory in August. “We all recognize that the path forward will involve challenges. It will take a willingness to innovate and take bold steps together,” the province says.